Background: Stilbenes, 1,2-diphenylethen derivatives, including resveratrol and combretastatins, show anticancer features especially against tumor angiogenesis. Fosbretabulin, CA-4, in combination with carboplatin, is in the last stages of clinical tests as an inhibitor of thyroid cancer. The mode of action of these compounds involves suppression of angiogenesis through interfering with tubulin (de)polymerization. Objective: We have previously synthesized five E-2-hydroxystilbenes and seven dibenzo [b,f]oxepins in Z configuration, with methyl or nitro groups at varied positions. The aim of the present work was to evaluate the anticancer activity and molecular mechanism(s) of action of these compounds. Results: Two healthy, EUFA30 and HEK293, and two cancerous, HeLa and U87, cell lines were treated with four newly synthetized stilbenes and seven oxepins. Two of these compounds, JJR5 and JJR6, showed the strongest cytotoxic effect against cancerous cells tested and these two were selected for further investigations. They induced apoptosis with sub-G1 or S cell cycle arrest and PARP cleavage, with no visible activation of caspases 3 and 7. Proteomic differential analysis of stilbene-treated cells led to the identification of proteins involved almost exclusively in cell cycle management, apoptosis, DNA repair and stress response, e.g. oxidative stress. Conclusion: Among the newly synthesized stilbene derivatives, we selected two as potent anticancer compounds triggering late apoptosis/necrosis in cancerous cells through sub-G1 phase cell cycle arrest. 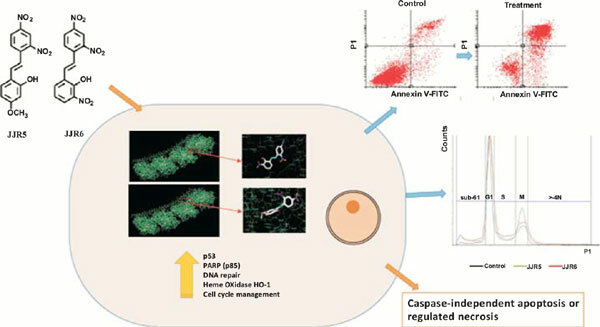 They changed cyclin expression, induced DNA repair mechanisms, enzymes involved in apoptosis and oxidative stress response. Compounds JJR5 and JJR6 can be a base for structure modification(s) to obtain even more active derivatives. Anticancer agent, stilbene, oxepin, apoptosis, cell cycle arrest, EUFA30, HEK293, HeLa, U87.